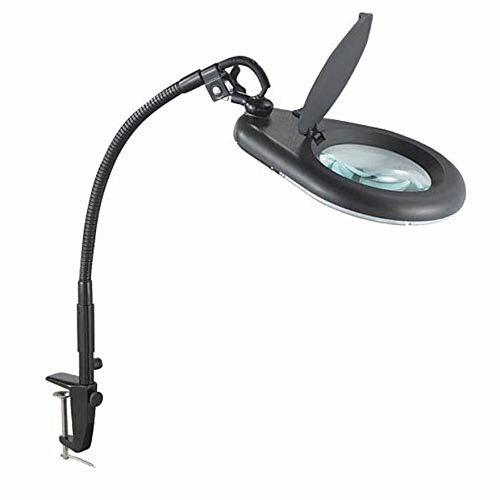 Gooseneck Magnifier Lamp - Latches onto a desk with the use of the clamp at one end as thick as 65mm thick. An energy efficient 22W T5 Circular Fluorescent tube Lamp provides a steady, shadow-less light source. A flappable Protective lens cover blocks the 2.25x magnifying glass when not in use. The Gooseneck allows full flexibility of the lamp, allowing you to angle it in any direction needed. If you have any questions about this product by Eclipse, contact us by completing and submitting the form below. If you are looking for a specif part number, please include it with your message.